Whether you are planning a movie with friends or trying to schedule a lunch meeting with clients, finding the right date and time that will suit everyone requires effort. If you are working in a corporate environment, scheduling meetings is not that big a hassle because you can check availability of people through Outlook Calendar itself. The situation however is a bit different when you are planning events with friends and family members as their schedules aren’t published anywhere. In such cases, you can either propose some tentative dates to your friends through email (or personal phone calls) and then analyze their responses in a spreadsheet, or if you want to save some time, try these wonderful web apps that will make it easy for you to decide dates that are convenient for the entire group. 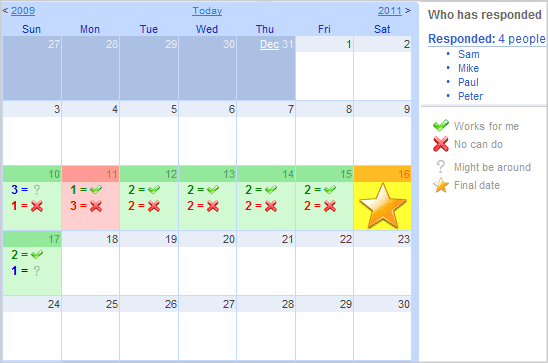 Which Date Works will help you quickly shortlist dates that will be preferred by your friends and family members. You start by selecting a list of tentative dates for the event (it could be a movie show, a birthday party or even a family outing) and then send out the proposed dates to all your friends using the tool itself. Your friends will get an email with a secret link that they’ll have to click in order to select their preferred dates. They can either say Yes, No or Maybe which indicates that they may or may not be available on a particular date. Once you have all the responses, finalize the date that works best for the majority and a confirmation email will go out to all the invitees. While “Which Date Works” is perfect for planning events within a group, the downside is that it works only with dates so you can’t use it for planning meetings or events where “time” is an important factor (a lunch can start at 12:30 or even 1:00). 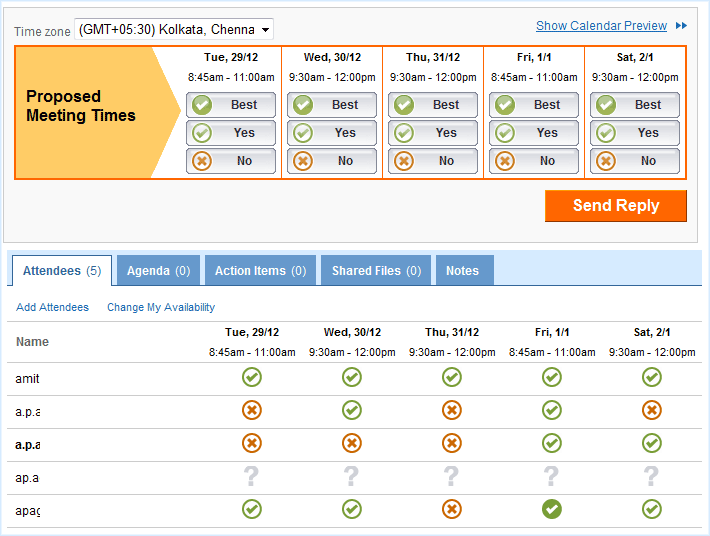 Enter Tungle – this is another cool application for scheduling meetings online that will take care of the time factor. You start by sending out email invitations proposing multiple times and, based on their responses, Tungle will automatically find the time that works best for everyone. You can sync Tungle with Google Calendar and Microsoft Outlook and they even have an iPhone App that will let you schedule events from the phone. If you are trying to figure out the best time for scheduling online meetings, Time Bridge is a good option. It will send out an email to your clients and once all of them have responded, you can refer to response chart to pick a time that bestsuits everyone. A unique feature of Time Bridge is that you can attach the meeting agenda, files and other documents with the meeting request itself so everyone has access to the required material at the time of the actual meeting.